Transhumanism and the Postmodern Future: Will Technological Progress Get Us There? ==> Introduction to Athanasius’ On The Incarnation. The two books listed below stand as a kind of preliminary study to reading Lewis’s books–as well as any other kind of book or writing. Adler’s book is especially well suited for Lewis’ writings, and since its publication many teachers and scholars have come to view it as a ground breaking classic. This study offers outlines and gives an array of analysis to a number of genres giving detail to the ways in which one can profitably approach the reading of any kind of book whatever genera it’s been written in, including: scientific, poetic, philosophical, or theological forms of knowledge. The hotlinks beneath the How to Read A Book You Tube provides a description and outline of the Adler book along with order information for those interested in obtaining it. Douglas Stuart and Gordon Fee’s work is a book which specifically deals with the sacred books of the Old and New Testaments within which a multitude of existing genera are found. Together, Alder’s How To Read a Book, along with Stuart and Fee’s How to Read the Bible for All It’s Worth, provide a complete guide to the reading both the old and new testaments as they take into consideration many aspects of all genera. You will find, in the introduction to How to Study the Bible for All It’s Worth, reference being made to Adler’s book as it gives a full endorsement to Adler’s work, recommending to their readers Adler’s treatment of how to read these books (i.e., both the Old and New Testaments) along with virtually every other kind of book. About this author: Mortimer Jerome Adler was an American educator, philosopher, and popular author. As a philosopher he worked with Aristotelian and Thomistic thought. He lived for the longest stretches in New York City, Chicago, San Francisco, and San Mateo. He worked for Columbia University, the University of Chicago, Encyclopædia Britannica, and Adler’s own Institute for Philosophical Research. Adler was born in New York City on December 28, 1902, to Jewish immigrants. He dropped out of school at age 14 to become a copy boy for the New York Sun, with the ultimate aspiration to become a journalist. Adler soon returned to school to take writing classes at night where he discovered the works of men he would come to call heroes: Aristotle, Thomas Aquinas; Mortimer Jerome Adler was an American educator, philosopher, and popular author. In addition, to hear a William F. Buckley interview with Mortimer Adler you can find it by going down beneath the information on How To Read The Bible for All It’s Worth at the bottom of this page..
For those of you who would like to listen to the whole of Adler’s phenomenal work, click on the title above and you will be taken to a series of 18 You Tube videos (one for each chapter of the book) that scans the reading as an audio presentation of the book is provided as well. 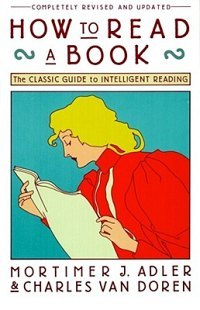 How to Read A Book: A Guide to Reading the Great Books is a must read for anybody and everybody. I thought I knew how to read until I read this book. With a practical way of navigating the reader through the various aspects of “reading” and all the minute variances one must be aware in order to get the correct communications from the author..
Understanding the Bible isn’t for the few, the gifted, the scholarly. The Bible is accessible. It’s meant to be read and comprehended by everyone from armchair readers to seminary students. A few essential insights into the Bible can clear up a lot of misconceptions and help you grasp the meaning of Scripture and its application to your 21st-century life. More than half a million people have turned to How to Read the Bible for All Its Worth to inform their reading of the Bible. This third edition features substantial revisions that keep pace with current scholarship, resources, and culture. Changes include: * Updated language * A new authors’ preface * Several chapters rewritten for better readability * Updated list of recommended commentaries and resources Covering everything from translational concerns to different genres of biblical writing, How to Read the Bible for All Its Worth is used all around the world. In clear, simple language, it helps you accurately understand the different parts of the Bible—their meaning for ancient audiences and their implications for you today—so you can uncover the inexhaustible wealth contained in God’s Word. PDF Document Download: Structural Outline for: => How to read the Bible for All Its Worth. Here’s An Amazon Link for: => How to Read the Bible for All It’s Worth. To find out more about Dr. Adler and his work follow this link to get to our ==> Mortimer J. Adler page.